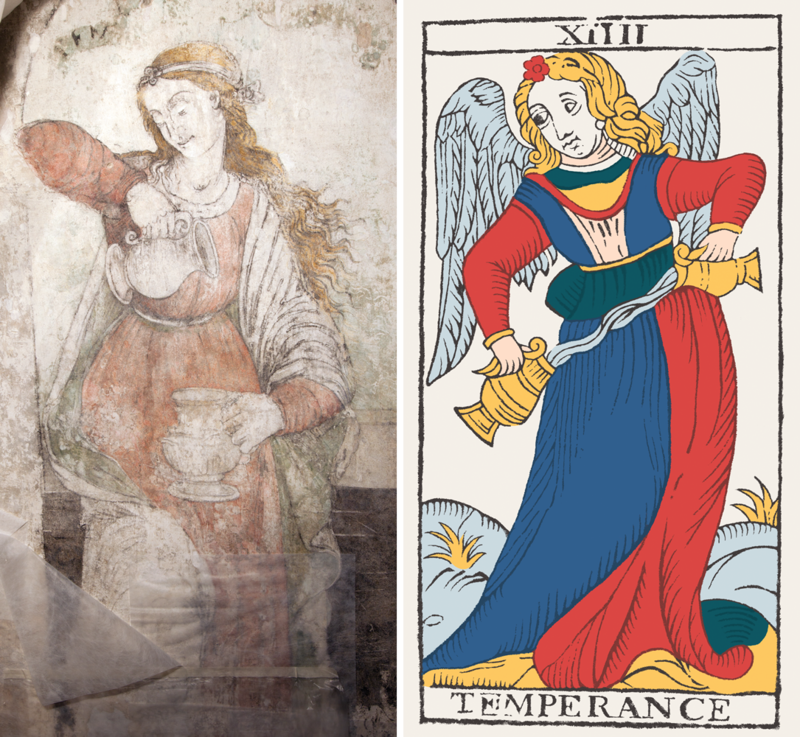 A comparison of the Temperance of Esztergom with the Temperance of the Tarot of Marseille. On my computer screen, the image was hardly bigger than a business card, but it was large enough for me to recognize in it an allegorical figure of the cardinal virtue of Temperance. This image presented a remarkable likeness to the 14th trump card of the Tarot of Marseille, Temperance: 1) The two young women are both standing in front view, with a jug in each hand, pouring the contents of one into the other. 2) The hand gestures are similar. 3) The jugs’ designs present quite similar shapes: round bodies with scroll-ended handles, with flared mouths and bottoms. 4) The clothes show affinities: the long, high-waisted dress with a round, bordered neckline; the thin belt; and the edging at the wrists. 5) Both heads are slightly turned to the right and tilted toward the right shoulder. 6) There are similarities in the lines of the eyebrows, noses, and mouths, which feature well-marked corners. 7) Both figures have long, blond, wavy hair, freely and abundantly flowing behind the left shoulder. 8) The knot that decorates the headband in the painted figure is replaced at the same place by a flower of the same size in the Temperance card. I had happened upon the vignette-size image in June 2007. The text that accompanied it on the Reuters news service website explained how this fresco in the Hungarian castle of Esztergom, representing the four cardinal virtues, recently had been attributed to the famous Renaissance painter Sandro Botticelli. The lead seemed promising. Botticelli had worked almost all of his life in Florence, precisely during the time of Marsilio Ficino, and ranked among the circle of artists who gravitated around Ficino’s patron, Lorenzo de’ Medici. Could the Florentine genius of painting have played a role in the creation of the Tarot of Marseille? The Hungarian art restorer Zsuzsanna Wierdl made the announcement of the discovery during an international conference in Florence. For seven years before that event, almost every day, she descended into the depths of the castle of Esztergom, about 60 km north of Budapest, to get to her working place. The job was assigned to her in 2001. Some frescoes were unearthed in 1934 during archaeological excavations in the ruins of the archiepiscopal castle. As the accumulated debris was being cleared, a large room decorated with paintings was uncovered for the first time in 340 years. An initial restoration campaign then took place, under the direction of the great specialist at that time, the Italian Maurizio Pellicioli. His work mainly tended to reinforce the pictorial layer with cement. Other smaller interventions followed until the 1970s, when synthetic substances were applied to help protect the paintings. However, these products did not age well, turning yellowish and tarnishing the underlying colors. This added to a layer of earth and carbonate formed on the frescoes during their time underground and to early repaints — a practice that entailed “refreshing” the colors by applying new layers of paint — before the palace’s collapse. Zsuzsanna, in agreement with the art historian Mária Prokopp, the restoration’s scientific supervisor, took the challenge of returning to the original pictorial layer, eliminating the successive strata that progressively had obscured it. A long and painstaking process began: Millimeter by millimeter, Zsuzsanna removed the layers without damaging the precious original paintings. After the elimination of the rough repaints, the fresco presented a new aspect. Little by little, Zsuzsanna revealed the original drawing, as it had appeared under the artist’s brush. The ultimate finishing layer, however, disappeared almost completely, destroyed by centuries spent underground. What remains, thus, is the first preparatory stage of the fresco, with the major initial strokes and colors. Zsuzsanna, amazed by the incredible strength of the original lines, progressively realized that the painter’s hand was that of a Master, a great Master, probably one of the greatest. In tandem with her work as a restorer, Zsuzsanna investigated, researched, and consulted. At some point, she had no more doubts: The fresco of the Cardinal Virtues had to be the work of Sandro Botticelli. She revealed her conclusion to Prokopp, who admitted having reached similar conclusions as well. Together, they decided to publicize the discovery at the June 2007 conference in Florence. Their arguments are precise and complementary. The restoration work allowed for the identification of a particular technique used by the artist, known as secco a calce. First, an outline is drawn and colored in on a freshly laid layer of lime plaster. The painter then complements the details on the dried surface with further applications of paint and gilding. This method was characteristic of the work of Filippo Lippi, Botticelli’s master. Botticelli used the same technique in some of his works, notably the Lemmi villa frescoes. In addition to this, Zsuzsanna identified the presence of a very fine preliminary drawing, traced with silver point, a customary Botticelli technique. This freehand outline, made without a stencil, is the mark of a firm and assured hand. However, the stylistic correspondences are the most impressive: 1) Temperance’s face is very similar to that of other feminine figures by Botticelli, like Venus in the Birth of Venus or one of the Graces in the Lemmi villa frescoes, especially when considering the lines of the chin and neck, and the delicately rounded curve of the eyebrows. Neck and chin lines compared: a Grace from the Lemmi frescoes, Esztergom’s Temperance, and Venus from Botticelli’s Birth of Venus. 2) Zsuzsanna points out Temperance’s ear, where multiple and tangled preliminary drawings reveal the difficulties encountered by the artist. It can be easily verified that Botticelli rarely represented his feminine models’ ears, as if he were ill at ease with that body part. What’s more, in the Esztergom fresco, traces of gilding found over the ear seem to attest to the fact that gilt locks of hair did mask this organ in the painter’s finished version. 3) The use of gilding in the hair and the precise drawing of the locks are recurring features in Botticelli’s art, which can be observed, for example, in the Birth of Venus, or the Lemmi villa frescoes. 4) Traces of gilding also were found on the dress and on the headband of Temperance, a technique also used by Botticelli, as attested notably by the Lemmi villa frescoes. 5) Wierdl also notes the numerous pentimenti in the fresco, another feature often observed in Botticelli’s works, as he strived to find the best graphical solution until the work was achieved. 6) The contours of Temperance’s face (as well as those of the other virtues) are outlined in black. This also can be observed in several Botticelli works, such as his Moses in the frescoes painted at the Vatican in 1481-1482. 7) The outline of the face in Esztergom’s Prudence, seen in profile, matches almost exactly, in reverse, that of the Hour figure in the Birth of Venus. A comparison of the head of Esztergom’s Prudence with that of the Hour in Botticelli’s Birth of Venus. Prokopp and Wierdl are well aware of the doubts raised by the fact that no testimony or record exists to confirm that Botticelli traveled to Hungary. Except for a stay in Rome from 1481-1482, his known career as a painter was carried out exclusively in Florence. However, Prokopp identifies a period in the artist’s life for which the data accessible to researchers does not exclude travel far from Florence. Born in 1444 or 1445, Botticelli started working at around the age of 13 as an apprentice goldsmith. Circa 1461 or 1462, he quit his first job to join the workshop of one of the most famous painters at the time: Filippo Lippi. In 1467, Lippi left Florence for Spoleto, where he painted a fresco in the choir of the cathedral. However, Botticelli did not follow his master. The track of the young painter – age 22 – then disappears until June 1470, when he obtained an important commission from Florence’s Tribunale della Mercanzia. During the period between 1467 and 1470, art historians cannot attribute, with absolute certainty, any painting to Botticelli. Prokopp said it might well be that during this period, Botticelli went to Esztergom to paint the Cardinal Virtues fresco. It was a time of political rapprochement between Florence and the kingdom of Hungary, a climate favorable to cultural and artistic exchanges. Such an important achievement also would explain the credit given to Botticelli in 1470, when the Tribunale della Mercanzia entrusted him with a notorious public commission, over the more experienced artist Piero del Polaillolo. What was the theme of this commission? A feminine allegory of Fortitude, one of the four cardinal virtues. If Botticelli had just successfully finished the Esztergom cardinal virtues fresco, would he not have seemed qualified to paint one of the cardinal virtues for the Florentine Tribunale? http://www.reuters.com/article/us-hungary-botticelli-idUSL0885377420070608 (link checked on 9/08/2016). Italy & Hungary. Humanism and Art in the early Renaissance. Florence, Villa I Tatti, Harvard University for Italian Renaissance Studies, 6-8 June 2007. Mária Prokopp, Gli affreschi quattrocenteschi dello studiolo del primate del regno d’Ungheria a Esztergom: una nuova attribuzione; Zsuzsanna Wierdl, Nuovi risultati sul restauro degli affreschi quattrocenteschi dello studiolo del palazzo arcivescovile di Esztergom, in Péter Farbaky, Louis A. Waldman (eds. ), Italy & Hungary. Humanism and Art in the early Renaissance, Florence, Villa I Tatti, 2011, p. 292-342.